Bernard Foley’s last-gasp penalty broke Scottish hearts in an epic quarter-final battle as Australia beat Scotland 35-34 at Twickenham. The Wallabies defeated Scotland in a game of high drama which saw Greig Laidlaw criticise the match officials in his post-match interview. Australia scored five tries to Scotland’s three but the difference was Foley’s boot. Some contentious refereeing by Craig Joubert will have the Scots shaking their heads. Mark Bennett’s 75th minute try took Vern Cotter’s team to the brink of a semi-final against Argentina but Foley had the final say thanks to some questionable refereeing. Australia threatened early on and Scotland did not heed the warning signs, Mitchell knocking on over the try line. 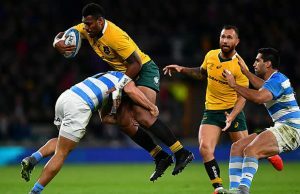 The Wallabies’ pressure finally told when Tommy Seymour darted out of the defensive line and was bounced by Tevita Kuridrani, continued his run before sending Adam Ashley-Cooper into the corner. Foley’s metronomic boot usually so accurate – earning himself the moniker of “Iceman” after his halfway line winner for the Waratahs against the Crusaders in the Super Rugby Final in Sydney in 2014 – was anything but. Laidlaw’s penalty after a multi-phase move in Australia’s 22m ended when a Wallaby went off his feet, 5-3 after 14 minutes. Scotland were growing into the game and after another extended spell in Aussie territory; a 16-phase play ended with a Peter Horne pick-and-go through a ruck from close range to score. 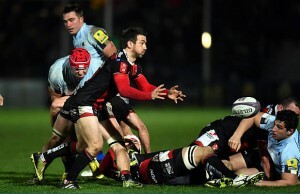 Laidlaw had an easy conversion giving his side a five-point lead. Scotland’s intensity continued to knock Australia out of their stride as the errors mounted. Foley had already lost two high balls and his kicking was wayward. WP Nel won began his dominance over Scott Sio – winning the first of two first half scrum penalties for collapsing. The Scots’ skipper extended the lead to eight points with a long range penalty. Australia hit back when Drew Mitchell scored his first try after sustained pressure in Scotland’s 22. Foley passed to Kurtley Beale who floated a long skip-pass to the wing to score un touched. The “Iceman” could not add the extras: 10-13 to the Scots. Nel won another scrum penalty against Sio after Australia made a mess of a restart, Laidlaw made no mistake with the kick. With a minute remaining on the clock Stephan Moore’s decision to kick for the corner paid dividends. The skipper threw to Scott Fardy, the forwards set-up a driving maul and scored through Hooper. Scotland led 16-15 at the break as the flyhalf missed his third consecutive conversion attempt. Joubert and TMO Ben Skeen’s controversial decision to send Sean Maitland to the sin-bin because of an intentional knock-on, much to the dismay of the Scottish fans inside Twickenham. While the wing was off Australia took the lead after another driving maul saw Will Genia pass to Mitchell for his second try of the match, this time Foley added the extras and Australia led by six. Australia thought they had another try for Ashley-Cooper but a TMO referral gave Scotland a life-line after Genia’s knock-on. Laidlaw and Foley traded penalties for a four-point margin as the Aussies at 25-19. This was a game of inches. On the hour Finn Russell charged down Foley’s clearance regathered and popped to Seymour to reduce the deficit to one. Laidlaw missed the conversion. A lost Scottish line-out in their 22 was costly as Kuridrani crashed over from close range despite John Hardie and Laidlaw’s attempt to halt the outside centre. Foley had found his range pushing his team’s lead to eight points with 15 minutes to play, but the Scots’ captain’s fifth penalty put Scotland within a try of the Wallabies with ten to play, 32-27. The game turned on its head when Bennett intercepted James Slipper’s pass to score under the sticks, Laidlaw’s conversion put Scotland two ahead with five minutes to play. Scotland’s line-out, normally excellent, ultimately cost them the game. A deep throw was lost, resulting in the controversial penalty. Up stepped the “Iceman” Foley to break Scottish hearts. 15 Kurtley Beale, 14 Adam Ashley-Cooper, 13 Tevita Kuridrani, 12 Matt Giteau, 11 Drew Mitchell, 10 Bernard Foley, 9 Will Genia, 8 Ben McCalman, 7 Michael Hooper, 6 Scott Fardy, 5 Rob Simmons, 4 Kane Douglas, 3 Sekope Kepu, 2 Stephen Moore (captain), 1 Scott Sio. 15 Stuart Hogg, 14 Sean Maitland, 13 Mark Bennett, 12 Pete Horne, 11 Tommy Seymour, 10 Finn Russell, 9 Greig Laidlaw (captain), 8 Dave Denton, 7 John Hardie, 6 Blair Cowan, 5 Jonny Gray, 4 Richie Gray, 3 Willem Nel, 2 Ross Ford, 1 Alasdair Dickinson. Replacements: 16 Fraser Brown, 17 Gordon Reid, 18 Jon Welsh, 19 Tim Swinson, 20 Josh Strauss, 21 Henry Pyrgos, 22 Richie Vernon, 23 Sean Lamont.